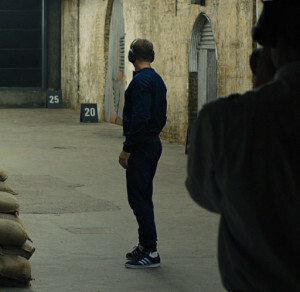 James Bond trains in a royal blue tracksuit in Skyfall, and it’s only Bond’s second of the series. The first is a velour tracksuit in A View to a Kill, and whilst this one isn’t as luxurious it’s more practical and appropriate for Bond. 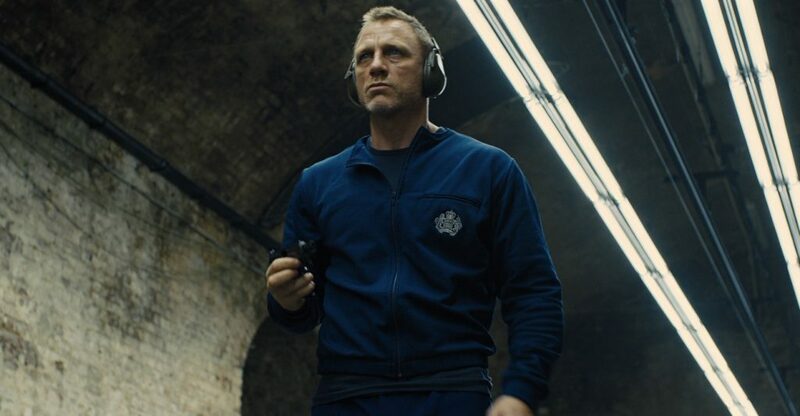 Despite being a Royal Navy officer, Bond wears a PTI (Physical Training Instructor) jacket of the British Army, issued by the Secret Intelligence Service (SIS) with a silver SIS crest on the upper left chest. There is a jetted zip pocket above the crest, and it’s the only outer pocket on the jacket. The jacket has a zip-front with set-in sleeves, a crew neck and ribbed elastic cuffs. The matching trousers complete the tracksuit. They have ribbed elastic bottoms like the cuffs on the jacket sleeves. The legs have a rib sewn down the centre of each leg. The ribs give the legs a creased look—this type of cotton cloth won’t take a crease—so the tracksuit has a more military-like look. Some may think it looks affected but I think it’s a nice touch. Underneath the tracksuit Bond wears a dark blue-grey long-sleeve, crew-neck shirt in a waffle knit. 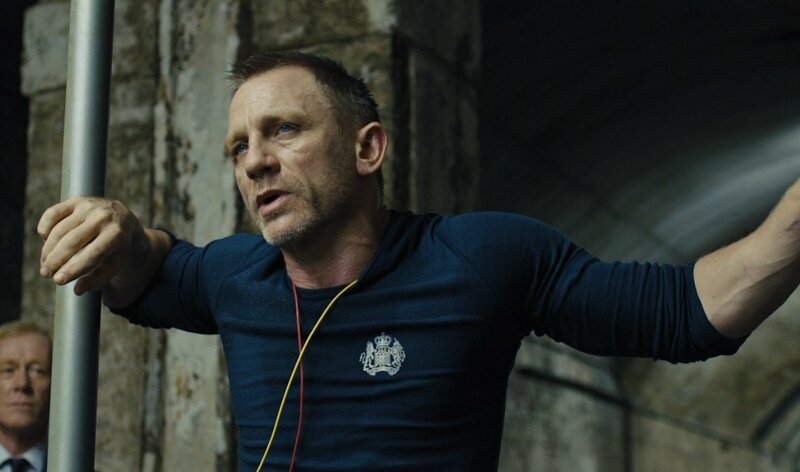 The shirt has regular shirt-style sleeves, and the narrow shoulders are emphasise Daniel Craig’s large deltoids. The sleeves have cuffs in a a finer knit but Bond rolls up the sleeves to the elbow. The shirt’s upper left chest has the same SIS as on the jacket. Bond’s socks are white athletic crew socks. The trainers are the Adidas Gazelle 2 model in Dark Indigo suede with Argentina Blue (pale blue) stripes. The soles are white rubber. I always thought it odd that anyone would wear Gazelles for real running or working out. They look good and the colour matches nicely here with the track suit but they are really what used to be called ‘leaisure shoes’ – there are much more practical options for the treadmill. I hope we won’t see Bond doing push-ups and abs, wearing a tight t-shirt and unshaven in the next movie. It’s most certainly due to the current trend of the metrosexual male look, etc etc, but that’s really a totally unBondian thing to see, as far as I am concerned. The shooting range scene, ok. I wish they would bring back the classic “Bond arrives at the airport and checks in at the hotel” or “Bond is having a fine meal” scenes, that would be a nice and refreshing scene. Taken out of context, I can see where this scene might be viewed as un-Bondian. Indeed, that is the point. 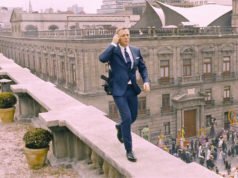 This scene was interned to further something called a STORY, which prior to Craig’s arrival had been low priority as James Bond under Brosnan had turned into a well-dressed comic book character. I agree with the posts below about the shoes. Not really appropriate for real exercise. However, as a whole they add to the very restrained appearance of this outfit. When I look around my local gym at all of the bright colors and futuristic fabrics, I am glad that they kept it simple for Bond. Adjusting cufflinks after jumping train cars and quipping with Komodo dragons isn’t comic book? FS, I know the point you are talking about. 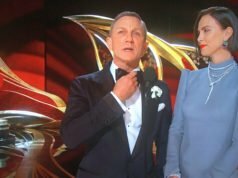 It’s just that it’s not enough of a justification to me, since I consider the script of Skyfall to be absolutely a mess and unbelievable, to remain polite ! It is enough with the “exercise” he does at Shrublands in TB, watching Bond do push-ups is just boring. I could not agree more with Le Chiffre’s first comment. Bring back a good old fashion dinner scene! They were doing fine in Royale. Brosnan survived 14 months in North Korea and could still swim ashore in Hong Kong. I am quite content with knowing that Bond exercises off screen, I don’t need to see it. Granted that it was appropriate for SF, I hope we don’t get more of that in the future. Kerim Bey was also a non-British MI6 agent. Yeah I suppose I always thought of that as a sort of pragmatic partnership with a local asset, who was rewarded for collaborative war service, but Silva is portrayed as almost a ‘pre-Bond’ first choice agent at M’s right hand as opposed to a Jonny on the spot holding the fort in some other country. Yes, but if I recall correctly, Kerim’s mother was an English governess and he had citizenship through her. Silva could have a similar story. We don’t know where his parents are from. I didn’t mind the unshaven look and work out stuff, but I agree I’d like to see the dinner scenes and check into the hotel scenes too. AND BRING BACK THE GUN BARREL AT THE BEGINNING! Sorry had to rant on that one. There’s something called the “principle of reversibility” when it comes to muscle mass and strength. It takes three times as long to lose as it takes to gain. That means that if you worked out properly (and most people don’t, but that’s another issue) for two months it would take six months to fully lose the strength that you gained. This tops out at 9 months; I’ve exercised for 25 years but my strength would disappear fairly quickly if I stopped. However, your cardiovascular fitness disappears quite quickly. So whether intentional or not the idea of Bond looking quite buff but getting winded training and swimming was a nice touch (in addition to showing him training at all, which was long overdue). Seconded, I was wondering that myself but this clarified things a bit. Thanks. Agreed about the gunbarrel… The Casino Royale one was great, but the last two were missed opportunities. Especially Skyfall’s, the idea of showing a “50 years” note was really terrible, in my opinion. It just entirely disconnects the viewer from the film and the script (I know, it’s the end, but there’s always a Bond mood at the ending, with the music etc) and the “007 movie” mood. Nice throwback to Fleming’s Bond, who had a workout routine that he engaged in every morning until his “muscles screamed”. It’s very odd that it took 50 years to see the Bond of the films do something so central to the book Bond’s lifestyle. As Ianiceman said, it had a great purpose in the plot. I like how utilitarian the outfit is, the shoes excepted. I’m not sure if it qualifies as a “track suit” as the online buzz is that they are Adidas sweatpants as opposed to the “official” bottoms that would go with the PTI jacket, but that’s quibbling. The jacket almost looks as though it’s polyester, but I hear that it is indeed cotton. I’d be tempted to get one myself to throw on after a workout. Fortunately, my gym is much nicer and more heated so I don’t have to wear a waffle-knit long-sleeve top and sweatpants when I work out! Glad to see this post. I thought the tracksuit was worthy of coverage when I first saw it in the movie. A minor correction: Britain’s army is conventionally referred to as the British Army or the Army, but not the Royal Army. Whoops! I guess they just wanted to go with whatever they thought the audience would buy as being “correct”. Maybe in this incarnation Bond was indeed an SIS? I vaguely remember Vesper something about “former SIS types with fake smiles and expensive watches” in the train scene in CR… Maybe it was a way to very subtly reference Bond’s past? You’re referring to SAS, the Special Air Service, which is part of the British Army. Bond has always been with the SIS, which is also known as MI6. And the modern film Bond spent time with the SBS before working with MI6. However, I assume that the filmmakers thought that audiences wouldn’t be as familiar with the SBS as they are with the SAS, which most people have heard of (and Vesper refers to SAS “types” anyway). This was actually one of my favourite Bond outfits. It’s standard army issue yet Bond makes it look good, he wears it with a great deal of disdain keeping with the character. I really liked the plotline that allows this to happen. As a student who’s actually taken Drama courses Skyfall is probably the best Bond film ever made. It follows a plot with an actor who is perfect for it and actually got immersed in his character, just my two cents. Is there such a as an official SIS or MI6 tracksuit? Does it look anything like the one daniel craig is wearing?